Tomorrow, Thanksgiving, is Bonny Anne's birthday! Hurrah! We have known each other since Third Grade, and I can honestly say that you have improved with age! (Of course, we weren't exactly friends back then, so maybe I am biased now.) You are a lovely person and a great friend. May you have lots of sailing ahead of you in the next year. Sunday night we had one of my favorite dishes: Greek-style stuffed eggplant. Ahh...The recipe comes from the old, original Moosewood Cookbook, and cannot be beat. It is just so good. We will be using the chicken on Thanksgiving, along with the sweet potatoes. The bok choy and poblanos are going into a wonderful sauce for fish. We are eating so well! It is Friday again. We have plans for tonight, but otherwise, I think we hope to have a nice, quiet weekend. There will be some grocery shopping, for next Thursday is Thanksgiving. We will not be having a turkey - too much food for two people - but we did buy a locally grown, organic, pastured roasting chicken. I have roasted a few turkeys, but never a chicken, so I am looking forward to it. I will probably make a pumpkin pie. I love pumpkin cheesecake, but again, with only two people, it is just too much - not necessarily in size, but definitely in calories. So, pie it is, made from scratch. A couple of weeks ago I cooked a pumpkin and pureed the flesh, so it is ready to go. And we will probably go on our now traditional day-after-Thanksgiving hike. It is a good way to avoid shopping and eating too much food. Last night, we had the pleasure of going to hear the Washington Saxophone Quartet in concert at UCA. They were artists in residence this week, giving lessons, a master class (which I would have liked to go to, had I not been working), attending classes, and giving the concert. It was quite a good concert, with music from Bach, Pat Metheny, Paquito d'Rivera, and Aaron Copeland, among others. My favorites were the Concerto by Allessandro Marcello - originally written for oboe and orchestra - that they played with the addition of the UCA saxophone professor, Jackie Lamar, the "New York Suite" by Paquito d'Rivera, and the one movement they played from "Songs for Tony," by Michael Nyman. I used to play the alto sax all the time - took classical and jazz lessons, played in band and jazz band - until I got to college and only had time for one instrument, and I used to absolutely love the alto. Now that I have been playing the bassoon for so long, I found myself more drawn to the sound of the tenor and of the baritone. Interesting. The size of the audience was a little disappointing, given that the concert was free, but not too surprising. I think it would have been better had the concert been in a smaller auditorium, so the crowd wouldn't have been so spread out. Oh well, we had fun. Speaking of herding cats, I could really use a nice sheep, err, cat dog to herd the cats for me in the mornings. Now that I am working full-time, I have to get up around 5:30 if I want to do tai chi or pilates before breakfast. The cats, of course, don't understand that this is supposed to be a quiet time, so they (especially Oliver) grumble and talk at me, wanting breakfast. 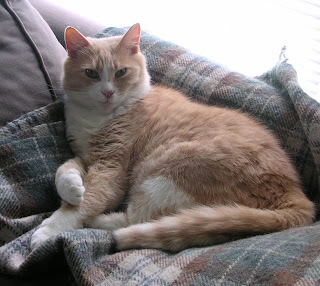 While it is distracting to be constantly meowed at while trying to concentrate on doing snake creeps down or golden rooster stands on one leg, it is more troublesome when it wakes Benjamin up. He is not a particularly good morning person when awakened too early, and meowing cats is not his preferred alarm clock. I am not sure if the cats are getting the message, or if it was a fluke, but they were quiet !! this morning. They didn't even demand wet food, once I made sure they had enough dry food. A miracle! Too bad I was doing pilates and not tai chi, because I bet they are back to normal tomorrow. Christmas is starting to pop up everywhere. At the grocery store today, the sound system was playing bad versions of Christmas carols. Yesterday at Barnes & Noble, there were large tables full of gift ideas and cards and calendars. The catalogs have started to arrive. I am trying to ignore Christmas for now - it is easier now that I am working - but I have to admit I did do a little shopping this weekend. I bought two new sets of Christmas lights - LED lights that are supposed to use about 90% less energy than traditional lights. The last time I bought lights was back in college, when I had my first apartment and my first tree! I also bought a box of cards, since I found one that I liked. But that is it. I know what I will be getting Benjamin, and most of what I am getting my parents, but I haven't done the shopping. Actually, I won't be doing much shopping anyway, since I hope to be giving things that I have made myself for the most part. And no-one I know really needs any more stuff anyway. Which brings me to the answer to the question, "What do you get the person who has everything?" - something for someone else! Every year, we make it a point to give money to one of a few charities in honor of our friends and families. A couple of our favorites are Heifer International, Habitat for Humanity, and any local food banks. Whatever group you use, you can check to see how well they use your money at Charity Navigator - they rate groups based on a set of criteria that include how much money actually goes to the people they claim to serve, how much the CEO gets paid, etc. I feel like I am really grown up, because I was born before the 1990s and can remember life before Clinton was president (unlike most or any of Benjamin's students) and I remember the debate about beta and VHS, but every once in a while I find something that makes me feel really young. For instance, I am reading Everything is Miscellaneous by David Weinberger, and at the moment he is talking about the adoption of bar codes and the UPC - it didn't happen universally until the mid-late 1980s. I can't imagine shopping without bar codes. Yikes. I guess it makes sense that they wouldn't be seen as a time saver until computers were widespread, but then, I can't really remember life without a computer. Since my dad is a computer programer, and has been since the late 1960s, computers have always been in my consiousness. What will my (hypothetical, future) children use as time and memory markers? So, after a day off yesterday, I head back to work on a Monday/Wednesday. A day at home is a lot more enjoyable when it is an occasional treat than when it is your normal way of life. I went to the gym, baked bread, cleaned off my desk, did laundry, and enjoyed being home on a week day. Now I am returning to work on Wednesday, a day that also sort of feels like Monday after my day off. Time is interesting that way - how we perceive it is so often based on the structure of life that we build around it. Because I was off yesterday, today feels like a new start, but since I was at work on Monday, it also feels like the middle of the week. When I wasn't working, I still created a bit of structure - doing certain errands and chores on certain days. When you are on vacation, and I mean really on vacation, time loses a lot of its structure, and it can be difficult to get back into the flow of work and day to day life as the vacation winds down. Time really is relative! In addition to the monuments to the fallen soldiers of the Confederacy, there are multiple monuments to soldiers of other wars. 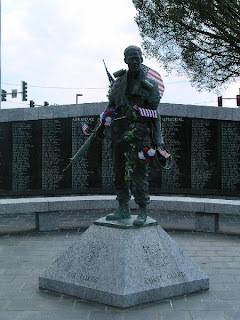 The statue of the soldier on the left is from the Arkansas Vietnam Memorial. Like the memorial in D.C., there is a simple wall with names inscribed on it. The soldier stands atop a pedestal with the various branches of the armed forces named upon it. It is very tasteful and rather moving. There is also a memorial to the various men from Arkansas (and they are all men) who have been awarded the medal of honor. I don't know how well you can see from this picture, but that is a statue of a soaring eagle. It is surrounded by pedestals with bronze colored plaques for each man, with a brief bit of biographical information and a sort of silhouette. It is rather horrifying to see how many wars the United States have been in, and to think how many lives have been lost. As an unrepentant pacifist, I believe that there is almost no time when war is an acceptable way to solve a problem, especially not when the problem is inflated, lied about, and almost completely manufactured. Today, however, on Veteran's Day, I do salute all the men and women, including my grandfather Richard Van Dyke, my cousin Richard James Van Dyke, my cousin Anna's husband, my friends Luke and Roger, and say thank you for being willing to take on the burden of service. Addendum: And Owen. Thanks to Benjamin for reminding me. The sky is just starting to lighten as I eat my oatmeal and smoothie. It is cold - not as cold as it was in NY at this time last year, but cold enough to actually feel like fall. This is good. One thing that I disliked about living in Austin was the lack of real seasonal changes. It was generally only cold in January and February, and then only occasionally - I remember several years where it would be freezing cold on Monday, but 75 or 80 by Friday. Arkansas seems to be more steady, at least in its progression towards the proper season. Anyway, it is Monday morning again. I get tomorrow (Veteran's Day) off, so Wednesday will sort of be like another Monday, but one with only a Wednesday and Friday to follow. (smile) I don't really feel like I need an extra day off yet - work isn't too draining - but I won't complain. Check back tomorrow for a post about some of the soldier memorials around the capitol grounds. 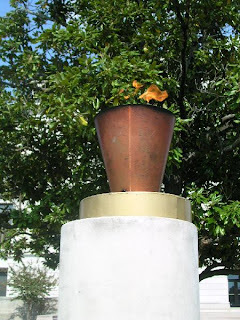 In honor of Barack Obama's win on Tuesday, I give you the Arkansas Flame of Freedom. I can't remember which group sponsored it, and I am not really sure what it stands for (apart from Freedom, that is), but here it is. The flame had a hard time competing with the sunshine the day I took this picture; I bet it is more impressive at night. 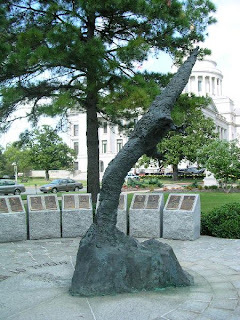 Anyway, it is on the north side of the Arkansas State Capitol. Too bad most of Arkansas didn't vote for Obama. Sigh. Yup, my 85+ grandparents were so excited last night that Barack Obama was elected that they couldn't go to sleep. I think that is so cool. I admit that I was not always on the Obama bandwagon - not that I didn't think he was cool or worthy, I just happen to have a soft spot for crazy Dennis Kucinich - but now, I am so very excited. My Obama magnet arrived on Election Day (only 2 months after I ordered it...) - a sign? Things are looking up. Too bad we have to wait until January for the inauguration. In case you missed The Speech last night, here it is. It is so nice to have a president-elect who is literate and intelligent. 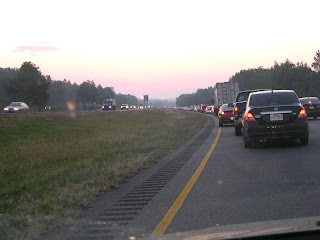 The commute to Little Rock can be a drag - lots of cars and trucks, and inexplicable slowdowns. People here slow down when they blink, it seems, and when the sun shines, and when it is cloudy, and if someone sneezed in the town nearest the freeway... You can see a little of the slowdown up above. There are, however, some consolations. The view in the early morning light, with mist rising among the trees, is lovely. 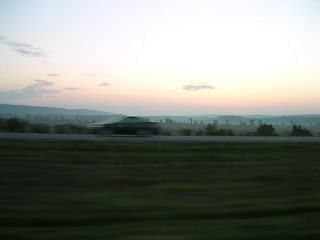 And since I am often slowed down or stopped, I can enjoy it. Yes, I took this picture while driving. I know, bad Hoperu... I am also able to listen to books on CD, and since I am in the car for an hour at a time, twice a day, I get through them pretty quickly. So, today is the day - Election Day. If you haven't already voted, go vote! Stay in line, even if it takes hours - it is important! I am a recent convert to the joys of proper oatmeal for breakfast. You see, my only real experience with it before recently was the little packets of instant, pre-flavored oatmeal that we used to take backpacking. They were lumpy and goopy - something my texture-sensitive mouth couldn't handle very well. As I've developed a more sophisticated palette, they also revealed themselves to be overly sweetened with a somewhat chemical tasting aftertaste. And they just didn't fill me up properly. The large amounts of sugar and high fructose corn syrup meant that they were a quick high, but also a quick crash. I'd be hungry, starving, shaking with low bloodsugar within an hour. So, I have started making real oatmeal on the stove (I have tried the microwave, but it always boils over - no matter what size bowl I use - and makes a big mess. Besides, I don't really like using the microwave to cook...feels inauthentic somehow.) I have tried it in the past, and wasn't impressed. No matter how much sugar and cinnamon I added, it never tasted very good. Well, I have discovered my error - no vanilla, and using water instead of milk. So now, I use Scottish oatmeal, which is not in flakes like "traditional" American oatmeal, or steel cut oats, milk, and a bit of vanilla. The result is creamy, flavorful, and filling. Yes, it is still a bit goopy, but as long as it tastes good, I can handle it. NOW I understand why people like eating oatmeal. Best of all, there I know what is in my food - no HFC, no chemicals. Hurrah! ...because I found Creamsicle! She was hiding in a shed just next to our property, and was probably just too scared to come when we called her. I had walked out to check the mail, had a feeling I should look around the house etc, and there she was! Hurrah!